What is a Yidam ? Yidams are fully enlightened beings. Often related to very specific stages in our spiritual life, a special deity that one will meditate on, in order to defeat or energize a particular aspect of our own self. The entire Vajrayana tradition rests on this notion working on our own perceptions and slowly bettering them. The Yidam is of great importance for those who consider themselves serious practitioners and in many cases the key to spiritual progression. The symbols and imagery behind the Yidams is a little more complex than perhaps most of the other classes of Thangkas. Yet the technique and skill require to accomplish such art is tremendous. It is indeed true that in essence almost any deity in the Buddhist Pantheon can be considered as a Yidam in specific circumstances. 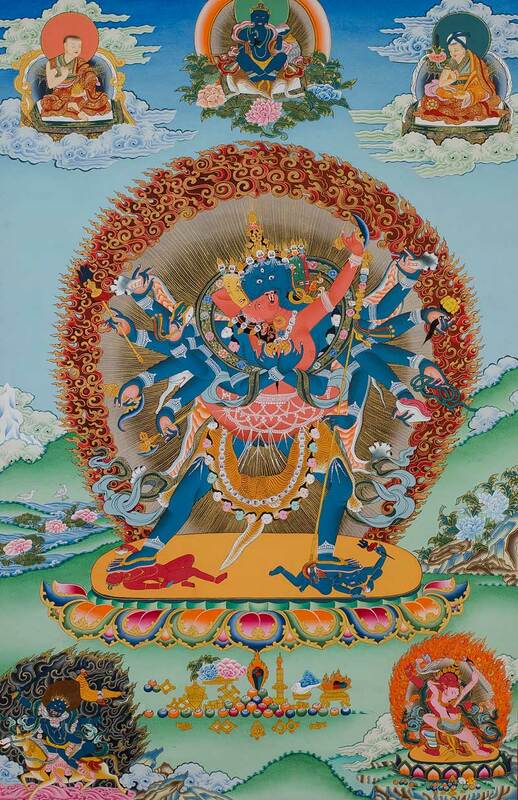 Here in Nepal however there are certain deities that stand out due to the long relationship Nepal has with Tantra. Kalachakra, Chakrasamvara, Hevajra are popular motifs you will find here. Due to the large amount of features such as hands and ornaments this class of deity can be painted to perfection by only the most seasoned artists and an innate natural skill.